Tokotas are not actually in the canine family. They are caniform, but are more closely related to bears. Originating as an apex predator native to the wild tundra of the Arctic Circle, they are primarily carnivorous and mostly eat seals and fish. They have a very strong rivalry with bears, but grew a mutual respect with primitive humans that began their long domestication over the centuries. The modern version of the of Tokota is far different from the prehistoric ancestor and only one of the original coat types — the "natural" type — remains. All other coat types were selectively bred into the species as a result of certain hair mutations. On top of being used for early transportation, guard animals, and hunters, they were revered as a sacred animal and most commonly bear the significance of strong loyalty in primitive symbolism. Gait: Similar to the gait of a wolf, but a bit more heavy and lumbering like a bear. Usually a lope type gait, although capable of a trot, collected canter, Spanish walk, etc. Lifespan: 1-30 years in captivity, 28 on average. 12-15 years in the wild. Breeding Limits: Available breeding slots go up with hierarchy status. For more information check out Breeding Your Tokota. Tokotas have 1-4 pups in a litter, which will stay with the mother until a year of age. In the wild, the sire and the rest of the pack will participate in raising the pups, regardless of hierarchy status. Anatomy: Tokotas are most commonly perceived as being closest in appearance to a mixture of polar bears and wolves, though, they have a unique profile with an elegantly tapered snout, short and stocky claws, and hooked canine teeth for ice fishing. Their facial anatomy is far more angular than that of a wolf, and far more canine than that of a bear. The neck, crest, and withers are protected by an insulating two inch layer of fat, and the fur consists of a dense underlayer with an exterior layer of guard hairs, which gives them a good resistance to the cold and harsh climate of the Arctic Circle. Fur may be shaved to prevent overheating in hotter climates. Tokotas are well muscled with a deep chest and sloping back, and are extremely suitable for mounts. Behavior: Attacks on people are very rare due to human influence on the breed, and in terms of domestication, Tokota are above horses, and very nearly close in docility to dogs and cats. While they have a wide range of utilities, they are also a popular choice as companions. 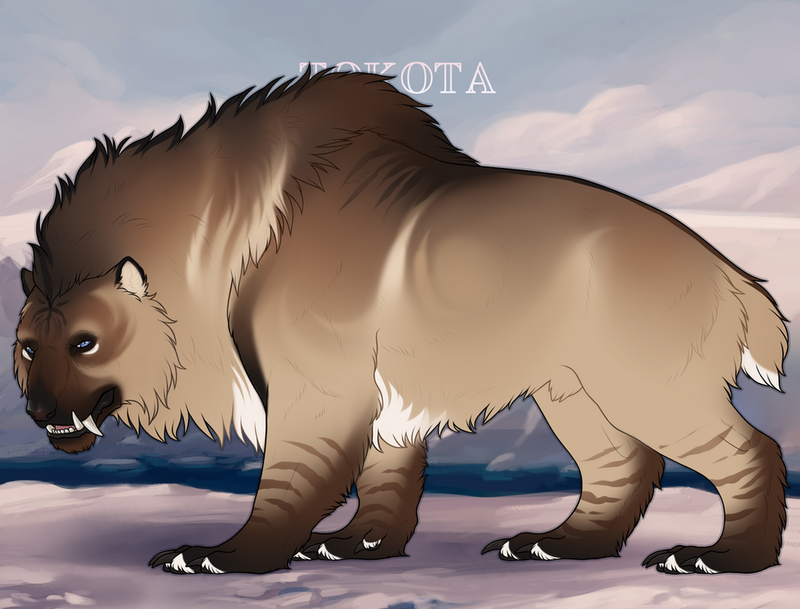 Tokota communicate most commonly in chuffs, growls, purrs, and long distance vocalizations consisting of deep, resonant howls, which fluctuate in pitch in a manner far more melodic than wolves or coyotes. Recent studies have shown that these are highly individual to specific packs and family groups. Pups have a high pitched, chirpy bark, but will start to mimic howling around the age of six months. The affectionately termed "Toki" is not a subspecies as such, but is the result of a dwarfism mutation on a normal build tokota. Gait: Bouncy, slight waddle/saunter. They run similar to a corgi. Uses: Companion animals, but have a variety of show uses, including special Toki sled racing, beauty and costume contests, etc. Lifespan: 24-27 years on average. Breeding Limits: Tokis are limited to the same number of slots as normal Tokotas. They may crossbreed freely with standard Tokotas and the mutation has around a 10% chance of passing on to offspring. However at this time because of unknown health hazards and the preservation of dire blood, Tokotas with dwarfism cannot crossbreed with Dire built Tokotas. Anatomy: Tokis stand around a similar height to a medium-sized pony, and are roughly the same length as ordinary Tokotas. With this mutation, the legs are stubby, though the rest of the body remains well-proportioned. Behavior: Tokis bred to be companions and show animals have typically never interacted with a saddle or carried a rider, but generally have a very docile demeanor. Tokis arising out of normal parents may be more independent and/or aloof as they perhaps were not selectively bred for their behavior. Despite their size, they are very sociable and get along well with most other animals. Tokis can be found in any breeding not involving a dire tokota with different amounts of success; all toki x toki pups will be tokis, but there is only a small chance with normal x normal breedings. They may also sometimes be tamed as wilds. The dire build is a subspecies of the more common Tokota, only recently discovered in a remote and isolated region of northern Nunavut. Lifespan: 1-28 years in captivity, 24 on average. 1-5 years in the wild. Breeding Limits: Dires have much more limited breeding than normal tokotas. For more information check out Breeding Your Tokota. Anatomy: Much larger and muscular than the average Tokota, these beasts are huge. They are distinguished from their smaller counterparts by their size, dense coat, slightly roman profile, and short bushy tail. Behavior: Harder to handle than common build Tokotas, mostly because of their size and lack of domestication. Can be extremely dangerous due to the former. Training one requires extreme diligence, caution, and patience, but is genuinely rewarding. The domestication process is very selective, if a pup does not make the cut in terms of disposition, it may be released back into the wild or culled. Dires can be obtained by either taming a wild one, breeding a normal x dire tokota, or a dire x dire tokota. For more information and percentages, check out Breeding Your Tokota. Gait: Slow and lumbering when walking, though they can quickly gather speed in a charge or sprint. Lifespan: 1-25 years in captivity, 20 on average. 1-50 years in the wild. Litter Size: 1 pup per litter. Breeding Limits: Akotas can only breed with Dires or other Akotas. They cannot breed at all with standard build Tokotas or Tokis. Their offspring will therefore always be either a Dire or Akota build. Restrictions: Breedings are not affected by the Prestige Breeder faction bonus, Lavender, Fertility Supplements, Close Care, Swan, Hare, Fertility Roots, Akna's Presence or any other item or trait that would affect litter size. Anatomy: Akotas have far closer resemblance to bears than their Dire cousins - they have very large and broad shoulders, giving them a ‘hump-back’ appearance. Their fur is very dense and wiry. The pads of their feet are also more ursine than their smaller ancestors, with long toes and claws. Behavior: Extremely aggressive and territorial. Their huge size and primitive instincts make them extremely hard to handle, and more than a few handlers have lost their lives due to mishandling and the Akota’s quick attacks. Interaction: A BEAST Certificate, earned through TCA Bonding*, is required to unlock the ability to participate in shows, activities, and breedings with an Akota. Heirarchy: Akotas in the wild are largely solitary and do not display hierarchical behaviour. Therefore Akotas don't have the same hierarchy levels as other builds. Due to their superior size and weight and for the sake of hierarchy-based restrictions they are generally considered to be on the same ability level as Alpha builds. Bears are related to the dog family though. What is the average pack size for wild packs? Can't seem to find that and I'm really curious! Thanks! I'd feel like it's somewhat like a wolf, where it depends on food availability, health of the pack in general, and how much the individuals within breed, as well as the morality rate of the pups and how many pups are born in each litter. I'd say anywhere from as low as like 5-8 to somewhere as high as even like 20-30 ish. But it can be determined by members themselves how many members they decide to put in packs. Since Akotas are considered to be on an alpha level, does that mean they are automatically granted the roll bonuses that are associated with exploring/caving/diving for dom and alpha tokotas? If the thumb is not in the image we may wish for Akota to be listed, but yes, they are. Just thinking about having a “short” Akota at my room. Can Akotas rear on their hind legs like bears do? If so, are they restricted to just sort of shuffling forward or are they able to pull off a moderately effective walk? Can Tokotas die in the game? If so, are they still able to be a personal oc, but are no longer able to participate in the game? Or can they not be used at all? What's the difference of a 25% dire from a 50% and a 100%? If the genotype says they're a dire regardless of the percentage they'll all end up looking like dires still right..? Yes, they look the same. The percentage is for breeding purposes. The higher the percentage, the more likely the pups will be dires. The only really difference is in breeding as far as I can tell They will all be on the dire import regardless of the percentage. I'm a little confused about something related to this species. What about this species makes them more related to bears than wolves/dogs? The only time this seems to be justified is with the "Akota Build". Otherwise, these guys are just big wolf-dogs with manes, aren't they? Maybe these could be part of the extinct Hemicyoninae subfamily which belons to Ursidae? It coud fit the lore that one genus (Canarctos) and its species managed to survive in North America, since there are also mammoths and smilodons in the game from prehistoric times. The subfamily is called "dog-bears". And aren't Tokotas just that? Actually, if I recall correctly, dog-bears were there own family, separate from both canidae and ursidae in the same way that amphicyonidae is. Haha that's pretty cool XD Interesting species. And thanks for the mention! Does anyone have a doki? So most Tokis' Can't be ridden? Will there ever be any plans to implement more or will it just be the natural? If we represent the breed correctly can we put them in a fanfic? Say a Harry Potter one? How can one obtain this new rare breed? Ahh okay is it under "events"? Just out of curiosity, are the heights able to go just slightly out of range to show an extreme circumstance (such as a toki that is only 73 cm tall, or a dire that's 212 cm)? Some animals are this way. Think like how pandas don't really know how to reproduce. Could be something like that..
Like, maybe because of the lack of range they develop heart problems or something? Yes! True. Thanks cause I hadn't thought of them. ahh I need to get one of these!! I cant wait to see what this new build is! Tokotas have their own unique system of genetics, along with birth rights (in-born heirarchy status) and several types of unique fur styles. There are four primary base coats. Tundra (common), Tawny (Uncommon) Brown (rare) and Black (extremely rare). As tones and hues get darker, they become more rare and less commonly seen. (TT/Tt) ranges from very light, creamy off-white, to light flaxen color depending on parentage. (Aa/Tt - AA/Tt - Aa/TT) can range from burnt cream, to a milk chocolate tan depending on parentage. (AA/Aa) ranges from tanned brown to very dark mahogany, and can be saturated to a point depending on parentage. Tutorial: Designing and Approving PupsThere are really only two steps required from you in order to bring a new tokota into the Tokotas world. If you're about to follow them, odds are, you own a genotype bought from either a member or the group. For those who don't know, your genotype outlines the genetics of your tokota, and provides a guideline for its appearance (and the appearance of its future offspring) in a handy string of letters. If you're planning to design the genotype yourself, some knowledge of genetics may come in handy. For this, we recommend looking at horse genetics to give yourself a head start. Even though Tokota genetics are not entirely the same as horses or dogs, this will be useful for understanding the basics. Newbie Resources and Getting StartedHello! Welcome to Tokotas! Below is our best attempt at explaining what tokotas are and what awesomeness you can get up to with them! Tokotas is a large and active group with lots to do, so we recommend you read this journal in chunks rather than trying to get through it all at once for best results. Tokotas are giant mammals similar to bear-dog hybrids. They're rideable and come in lots of different shapes and colors. They can be used for in-game events like activities, breeding, and shows, or kept as a personal OC, or both! Tokotas are not free to create; you must purchase, win, breed, or be gifted one in-game. Hierarchy SystemA tokota's hierarchy status is a symbolic measure of its experience and influence, shown in its visible confidence and body posture. Some tokotas will stay at the hierarchy status they were born into, but many - with or without help from their handler - will be able to rise through the ranks and claim the boons of a higher status. The hierarchy system is used to level up your tokota through drawing or writing about them. As they accumulate points your tokotas will rise through the hierarchy, eventually reaching Alpha status. When you believe your Tokota has enough HP to advance to the next hierarchy status, please proceed to the Hierarchy Updates journal! The Rites of Dominance are the gateway to leadership and wisdom for a tokota, and are not undertaken to all. You will choose three prompts from a list of many depending on the animal that best represents your tokota's soul, and write or draw them. When submitted, you will receive a pass/fail response based on the judging below. Only one tokota is allowed to enter per prompt (meaning you can depict other tokotas, but no simultaneous entries for Rites of Dominance), unless you are collaborating with another member. In this case, up to two tokotas are allowed to enter at the same time, but they must be doing the same prompts. This is a series of events that are required in order to breed your tokota. All three must be passed in order to receive an Arms of Akna award. Not only are these mandatory if you wish to breed, they will also help shape the future career of your tokota. The third rite has two options, each affiliated with a different faction. You may complete either rite, but will only receive faction points for completing the one that corresponds to your registered faction. You do not have to pick a faction in order to complete these rites! The maximum number of tokotas you can participate with in one rite entry is three. You may include other tokotas for HP or story purposes in the rite entry if you wish, but only up to three may be judged. Tokotas must be uploaded in order to participate in rites. These two factions comprise two very different branches of the tokota world. Prestige Breeders are those that tend to focus on more domestic sports and advanced breeding, whereas Pack Leaders tend to make their living in colder climates, doing more traditional and rugged work than the former. When you join Tokotas, you have a choice to join either of these factions. Each have their own benefits. Regardless of which faction you choose, however, you may still participate in any discipline or type of show with your tokota and rider. Welcome to the tokota family! We are an independent rideable closed species ARPG with plenty of awesome features - including breeding, hunting, fishing and competing - to explore. Tribe fishing will only be unlocked once your tribe has earned Outdoor Enthusiast I. Tribe hunting will only be unlocked once your tribe has earned Outdoor Enthusiast II. Tribe exploration will only be unlocked once your tribe has earned Outdoor Enthusiast III. Tribemates have the option of doing activities together and including each other's tokotas for extra benefits and different prey types. All of the earnings from your tribe activities will go to you but you are more than welcome to donate a portion of it to your tribe if desired. If you are collaborating with a tribemate you may include up to 5 tokotas to be rolled for in your activity pieces instead of the standard three. Non-Physical TraitsTraits are permanently attached to your Tokota, and provide a number of advantages. There are different methods of earning traits. A Tokota can have a maximum of seven traits at Submissive and Average and can have ten traits maximum at Dominant and Alpha. An extra trait slot is purchasable in the bank for an Elemental Heart at the Soul Pool. This limit only counts towards hereditary non-physical traits. Physical Traits, Merit Traits, Alpha Traits and those purchased from the Soul Pool do not count against your available trait slots. If you have a trait you no longer wish to make use of you can replace them with a new trait, but you will not get this old trait back. For physical traits, see here! ActivitiesHunting, Fishing, and Exploration are activities through which you can earn pelts, fish, and items through artwork and literature. These rewards can be redeemed for Toko Tokens, used for crafting, or exchanged for a number of other items. Any Tokota can participate in activities regardless of hierarchy status, award status, etc. Please check the group's front page for the current hunting season. One of the major aspects of the game is breeding your Tokotas, while it may seem a bit complex at first glance, it is actually very simple. Before you begin, if you're new to genetics or want to breed something specific, take a look at this handy guide! Companion AnimalsCompanions - typically small animals and seasonal variants - can offer benefits to your Tokotas and help their career. You are welcome to integrate your Tokota's companion into your stories and art, or simply keep it as a passive addition for your tokota's award wall; you're not required to draw them at any point in time, so you can think of them as items, or give them life according to your preference. Below is a list of companions, separated by type. To apply a companion that you found to a tokota, make an item application in the bank. In order to apply companion benefits to an entry, please provide a link to the companion somewhere in the entry description. Two of the same companion will not stack. However, different companions with different bonuses in the same areas will stack with each other. Price ListsItems you find on fishing, hunting, exploration, caving and diving trips can be redeemed for TT and used for crafting; find how and how much here. Handler and Rider RulesDue to certain complications and confusion regarding handlers in the past, this guideline has been written to help you determine what is and is not acceptable as a handler/rider for events where handlers are required and for handler HP bonuses. You have a very wide range of artistic freedom for handlers, but due to effort-based rules, we do need to impose certain limitations. Your handler must be capable of actually handling the Tokota. Can a basketball logically hold a lead rope and calm a scared or angry horse-sized beast? No. It must be sentient (able to feel, perceive, or experience subjectively), with at least some kind of appendages and limbs for which to actually handle the animal. Tentacles, human or anthropomorphic arms/paws/hands, and robotic limbs are all fine. The Trading PostWhen you've redeemed items earned from activities and competitions, you will have TT (Toko Tokens), the fictional currency of Tokotna. With that you can purchase/apply these items at the TT Bank. Faded prices indicate the price with a Tribe discount. Looking for the Price Lists? The Passage of the Alpha is the ultimate test of leadership, strength, and integrity. Your tokota's merits will once again be tested; he or she will venture into the wilderness alone in an attempt to gain favor from Aippaq, and prove themselves worthy of being known as one of the great leaders of Tokotna. Not every tokota will make this journey, however, and the road ahead is dangerous and full of obstacles. Your tokota must be at Dominant status to participate. Your tokota must have at least 300 additional HP after reaching Dominant status (625 HP total if the tokota was originally uploaded as Submissive.) You must have your HP confirmed by an admin before you can begin the Passage of the Alpha. Your tokota must have successfully completed at least five each of hunting, fishing, exploration and caving/diving. The Tokota Cultural Association is looking for pups to adopt out to new Tokota enthusiasts. They are offering 250 TT for each pup donated! New to Tokotas and looking for a pup? You've come to the right place! Adoption is completely FREE! Comment to the correct thread. All genos will be worth 250 TT. Inbred genos are accepted but will not be available for adoption. You may donate unlimited genos. You may only request to adopt 1 geno. [Old] Requests page - Names, Ownership, etcIn reply to this journal entry will be a list of comments by TotemSpirit. If you want to change the name of your Tokota, want to transfer ownership, or would like personality added or changed, please reply to the corresponding comment (links below), with something clear and simple. No prefix on starter imports. DO NOT USE. Design Central has been upgraded to a tri-monthly thread, to avoid comment bloating. Please go to TotemSpirit's front page profile to find the current thread. This journal will serve as a directory for all things design related. Below you will find everything you need to know about getting your Tokota design a reality. 2. Fill out the info found here. 3. Make sure you have done everything on this list. 4. Reply to the comment below, with the info required. Your design will either be accepted right away or asked for edits. Home of all your designing and upload needs! There are four unique base coats within Tokotas: tundra, tawny, brown, and black. land of Tokotna. It's much easier to blend into one's surroundings when your coat matches them! There are also genes which modify the base coat colors, and these are known as modifier genes: grey, lilac and cream. Species InformationTokotas are not actually in the canine family. They are caniform, but are more closely related to bears.